Saint Addai, the apostle of Edessawas responsible for the growing Christian communities in Mesopotamia and in Syria east of Antioch. The legend of Addai is embodied in the Syriac document, Doctrine of Addai, which recounts the role of Addai and makes him one of the 72 Apostles sent out to spread the Christian faith. The legendary tale of how King Abgarus V of Edessa and Jesus had corresponded was first recounted in the 4th century by the church historian Eusebius of Caesarea and it was retold in elaborated form by Ephrem the Syrian. In the origin of the legend, Eusebius had been shown documents purporting to contain the official correspondence that passed between Abgar and Jesus, and he was well enough convinced by their authenticity to quote them extensively in his ecclesiastical history. By the time the legend had returned to Syria, the purported site of the miraculous image, it had been embroidered into a tissue of miraculous happenings the Doctrine of Addai is full of miracles, and antisemitism in the garbled story of "Protonike" consort of Claudius, searching for the Cross, and Golgotha and the Holy Sepuchre, all of them in possession of the Jews. 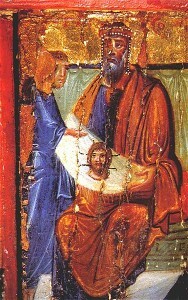 Above picture;Abgar receiving the Mandilion from Thaddeus (encaustic icon, Saint Catherine's Monastery, Mount Sinai). Finished reading about Saint Addai , Bring me Back to Catholic Saints please.